While I'm reasonably happy with my current 'crazy person' bee outfit, (cobbled together using various pieces of clothing, pants tucked into socks, and an old insect net which I found at the markets), now that we've got our beehive full of bees, I feel like I need to upgrade. Not that my current getup doesn't do the job - I haven't had too many stings - but it makes me nervous, which means I tend to check the hive VERY quickly, and perhaps not as thoroughly as I should. So I've decided to buy a proper bee suit. With a proper hat, and proper gloves. Exciting. To raise funds for this purchase, I'm silently auctioning off the tiny mouse in a tiny house I crocheted at the beginning of this year. It's adorable, and won first prize in the handmade toy section at the Bega show! 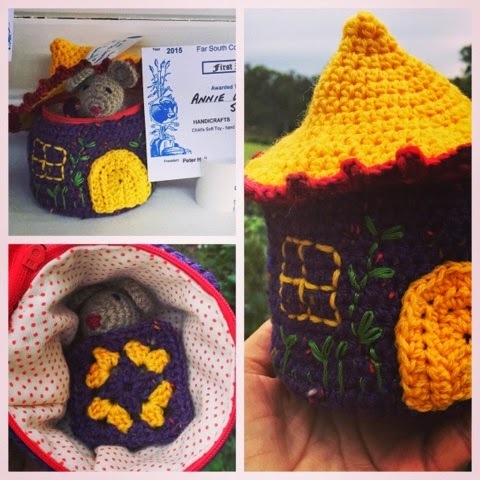 The mouse, house and blanket are all crocheted using 100%wool. The house is lined in polka dot fabric, and the lid/roof zips on and off so you can get your mousie out to play and then tuck it up in bed when it needs a rest. To be in the running to win this little mousie house, you just need to send me a message - pearlandelspeth at gmail dot com - with your offer. In a week's time I'll announce the winner.